Note: This is an excerpt from my first column at Medscape.com. While walking my dog one recent evening, I listened to a podcast in which two Internet pioneers suggested that there are only two ways to make money: via “bundling” or “unbundling.” They described everyday examples, such as the music industry, which started out by bundling individual songs into record albums. The music industry then turned to unbundling, when iTunes® sold individual songs for 99 cents, then bounced back to a bundling phase with such services as Spotify® or Rhapsody® that bundle entire music libraries to sell for a monthly fee. A similar ebb and flow occurred with television. Cable TV channels have long bundled individual channels to be sold as a package. However, we are now seeing unbundling, with such services as HBO GO® selling individual channels to consumers. Remember browsing the never-ending connections of the Internet on the World Wide Web using your desktop browser? The Web has also been unbundled. We all now have dozens of smartphone apps that offer unique, distinct, and generally siloed functionalities. Healthcare has experienced similar trends. Before the era of electronic health records (EHRs), the typical physician’s office had its own paper chart for each patient. Every chart was its own silo, unseen and inaccessible to other physicians’ offices. I can still remember working in my primary care clinic and having to ask my patients what their specialist had said in consultation, because I had no access to their consult note. Lab information systems, pathology systems, radiology systems, and billing systems were all separate. Today, at medium-sized to large healthcare organizations, the enterprise EHR has facilitated the integration of these systems. Hundreds or thousands of physicians across an organization share a single chart for a patient, which includes the patient’s lab results, radiology results, pathology results, and billing functionality, providing a unified and accessible medical record for each patient at each healthcare institution. At the same time, these institution-wide EHRs include potentially unwanted or unneeded functionalities, much like that bloated cable TV bundle at home. In some cases, EHRs contain some inferior modules that must be used simply because they came with the package, and they lack other capabilities that the organization really needs. Entrepreneurs have seized this opportunity, filling these functionality gaps and creating thousands of digital health apps. Each app attempts to offer a slice of functionality to consumers or to the healthcare system that is either unique or of higher quality. The trouble is that most apps create siloed data and siloed functionalities. Although the EHR is the centerpiece of clinical workflows, most apps do not easily interact with the EHR. Most apps do not exchange data with the EHR. Nor do most apps even interact with each other, allowing free flow of data between them. Click here for the rest of the blog post. Note: This is an excerpt from my most recent column at Medscape.com (full post at Medscape). Recently, I was given a first look at a fresh take on BG monitoring, created by artist and technologist Justus Harris. Justus is an artist and technologist based in Oakland, California, and Chicago who was diagnosed with type 1 diabetes at age 14 years. He is blazing a new trail by bringing together personalized health data and the tactile world, creating 3-dimensional (3D) data visualization sculptures. Often the most exciting innovations happen at the intersection of disciplines, such as the intersection of art, technology, and medicine. Sitting at this crossroads, Justus created an object that can be viewed through many different lenses. As an art gallery piece, it is a form of self-expression for someone struggling with a chronic disease, using art to humanize the BG numbers that he lives with on a daily basis. 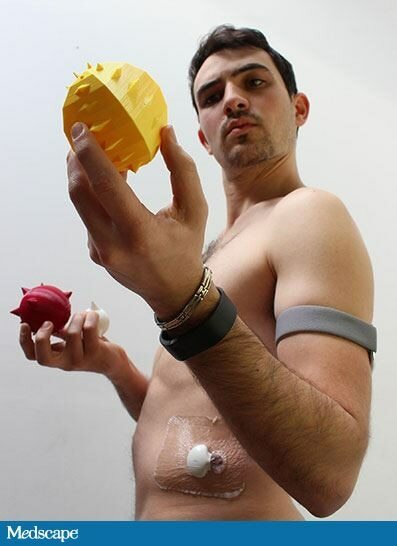 As a medical education tool, it is a very creative method that connects a patient with his BG data in a 3D, tactile, and visual fashion. This approach could even become a way for someone with low health literacy to rapidly understand whether his diabetes is in good or poor control, beyond what glycated hemoglobin conveys.